Click the button below to add the Rollz Flex White w. Denim grey bag - REGULAR to your wish list. Stylish. Fully certified rollator with the look of a designer shopper. Safe. Classic brake with drum brakes. Climb curbs easily with the standard curb climber. Practical. The large, water resistant bag can carry 44 lb (20 kg). Comfortable. Comfortable ride and natural suspension thanks to the soft tires. Convenient. Resting on the luxurious leather look seat with the handlebar in the forward position as a supportive backrest. Light and compact. The Rollz Flex weighs only 16. 3 lb (7.4 kg) and is easily folded for storage. Maneuverable. Very light steering and easy motion with the manoeuverable front wheels. Warranty: Lifetime Warranty on the frame, 5 years on the brake handles against defects in materials and workmanship. Those items not warrantied are wear items, such as handgrips, brake cables, and wheels. This warranty is valid for the original purchaser only, and is not transferrable. 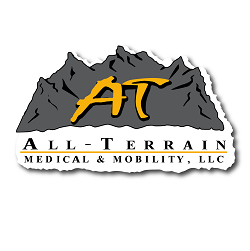 All-Terrain Medical & Mobility will not warranty any parts that have been damaged due to improper installation, modification and/or misuse. For warranty service please contact us at P: 877 255 8371.